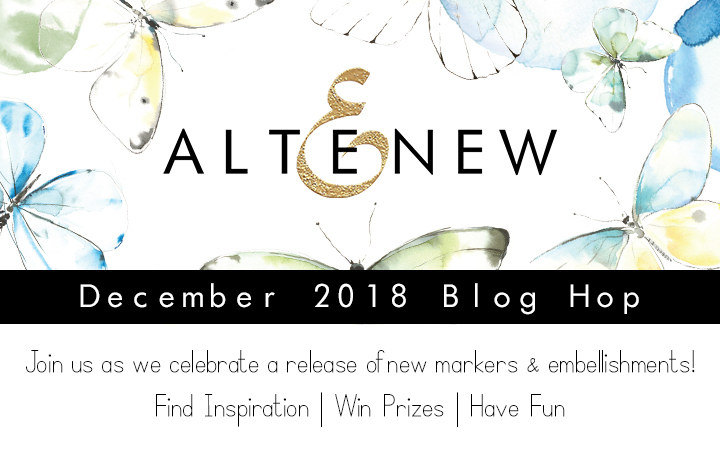 Hello everyone and welcome to the Altenew December 2018 Markers/Embellishments Release Blog Hop! If you came here from Erica’s blog, then you are on the right track. Otherwise, go back to Altenew Card Blog and start from there, as you won't want to miss anything! There are lots of new fabulous products being released today and all are now available for purchase at the Altenew online store. To celebrate this release, Altenew is giving away a $50 gift certificate to 6 lucky winners! 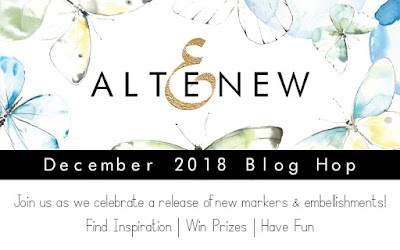 Please leave a comment on the Altenew Card Blog and/or Altenew Scrapbook Blog by 12/12/2018 for a chance to win. 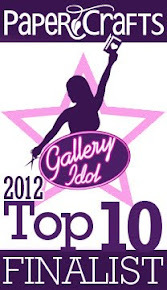 Six winners will be announced on the Altenew blogs on Sunday, December 16th. In addition, one winner will be chosen from the comments left on this blog post and will receive a $30 gift certificate. For today’s blog hop I’ve created a clean and simple card using the new Artist Markers Set E.
I started by stamping flowers and leaves from the Perfectly Perfect Stamp Set with Sand Dunes Crisp Dye Ink onto a watercolour paper. Then I used markers form the new set to do some colouring. I also used new Colorless Blender Marker for blending and to add some highlights to the coloured images. Next I fussy cut the elements and combined them with “hello” die cut from Flower Arrangement Die Set. Card is so pretty. Soft color at center of flower caught my eye. Very nice. Love the simplicity! I love the clean and simple look, it is so classic and elegant. The flowers look so delicate !! beautiful card. Wow! Such a stunning creation to end this blog hop! So beautiful!! I love the simplicity of this card. Very elegant. What a seemingly simple but very impactful card. Beautiful. Wow! Absolutely gorgeous. Thanks for sharing. This card gives me so much inspiration! Thanks for sharing! Absolutely gorgeous . Love who these colors pops over white . Amazing. Very pretty!! I love that the flower is so soft looking. Just beautiful. Your flowers are gorgeous, your design so beautiful - LOVE IT ALL! This card is so classy! I absolutely love the way you added the dimension! 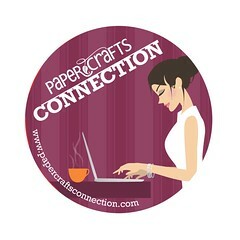 Excited about the new marker & embellishment release and cannot wait to get new goodies! How beautiful, I love how lifelike it looks. So beautiful! Love the delicate colouring. The new release is great. Especially the set E markers. This is beautiful and elegant! Your flowers are beautiful and I love the clean white background. It makes the bouquet stand out even more. Such a soft, gentle technique for coloring your flowers. It is simple but beautiful, just like I like. Thanks for sharing your creative skills. It is how we learn and grow creatively. I love the simplicity of your card and coloring.It looks just stunning !! I think this sweet card is just so beautiful. Such a lovely simple card...........Thank you. Beautifully simple with excellent use of product. Gorgeous - that flower looks so real. 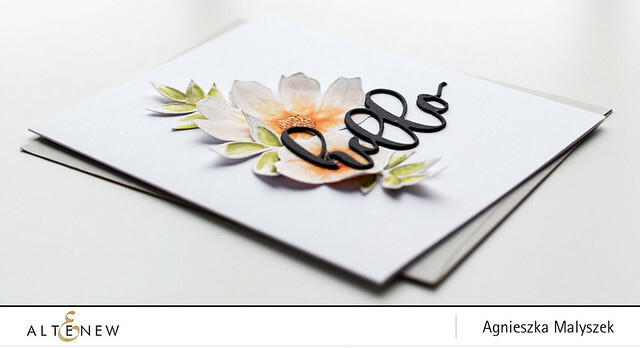 I love the bold contrast of the black die cut word against that lovely flower. A gorgeous card to finish out this blog hop. Love the clean look and subtle colors of this card! Thank you for sharing! Love the delicate flower and the dimension you gave it. This is very pretty! Your card is just beautiful. I often prefer the CAS card, and yours is a great example why. It uses those flowers perfectly. Thanks for sharing. Looks beautiful, especially with a clean background! Oh, what a pretty look you created. 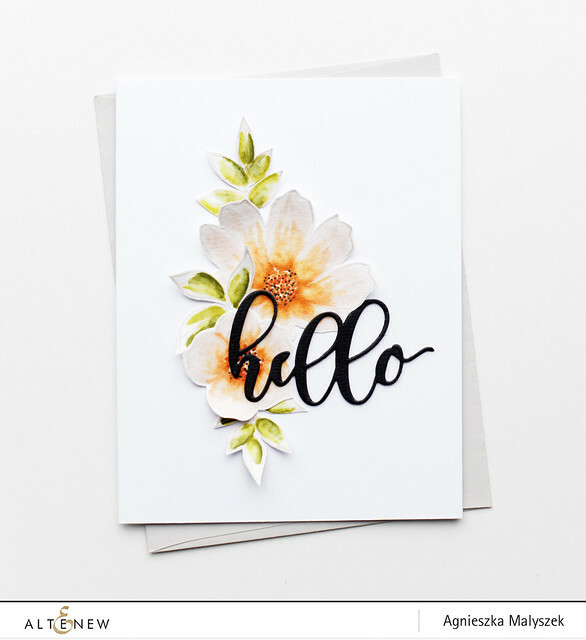 There have been so many vibrant, beautiful cards; it's really nice to see how to create this soft, delicate look as well. I'm definitely going to try and CASE this. Thanks for sharing such a lovely card with us! Such an amazing card, I loved your coloring. Mind blowing coloring skills. Love your card and the sentiment stands out. Thanks for sharing this gorgeous card--so elegant! The coloring is so delicate. Love how the petals pop up. You truly are the queen of CAS in my eyes, and this card definitely proves it. So beautiful in its simplicity! Stunning card. Your flower looks so delicate and realistic that it looks as if it is growing off the page. Thanks for inspiring me. Beautiful, elegant card. I love the colors and the style. Such delicate and pretty flowers! Love!!! beautiful card, great coloring. it turned out so elegant!! Simple, soft, and beautiful! I love it! Love your clean and simple card. Absolutely gorgeous! So soft and beautiful!! And the dimension is fabulous! wow! great way to make a "white" flower stand out! lovely!! Beautiful! So delicate and amazing dimension. Fabulous card!